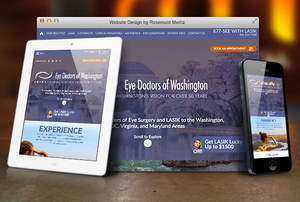 WASHINGTON, DC--(Marketwired - Apr 16, 2015) - As part of their mission to provide an unprecedented level of care, the ophthalmologists and optometrists at Eye Doctors of Washington (EDOW) are proud to announce the launch of their new practice website. The update to their site involves innovative features, including responsive and interactive elements -- all created for an enhanced viewing experience. EDOW believes the new design will provide an enhanced educational resource for their patients. As part of its eye care website design, EDOW's homepage involves new scrolling features that respond to the viewer's Internet device. Different fixed backgrounds and elements can be found when traveling down the page, and these features will automatically adjust to the appropriate screen dimensions for optimal viewing. The EDOW website has been designed as an interactive tool for patients. Common eye problems like nearsightedness, farsightedness, astigmatism, and cataracts have text-based and video explanations. The homepage also has a map resource where viewers can click on the different EDOW locations to find the address and contact info. For the creation of their new website, EDOW collaborated with the website design firm Rosemont Media. Both teams worked closely to develop the fully customized resource for patients, with the goal of providing a superior user experience. The eye professionals at EDOW are proud to introduce their new website to the public and hope the resource proves to be beneficial for anyone researching eye care conditions or treatments. The team at EDOW is composed of seven ophthalmologists and three optometrists, providing an exceptional level of eye-care, utilizing the latest advancements in the field. The practice has been serving the Washington, DC metro area for over 40 years, and offers state-of-the-art vision correction treatments like LASIK and laser cataract surgery. They are located in the Washington, DC, Maryland, and Northern Virginia area at their five office locations. The eye doctors are available for interview upon request.